That is not the sound of a 10 year-old after being told to clean up their room. That can be the voice in the head of the casual player who has realized that the best way to improve their gear situation or to see everything in the game is to group with people, perhaps people they don't know. Even if you're in a wonderful guild who lets you do things you'd like to do, the only way to see current tier content is to go with people. Some daily quests just can't be completed alone, either, and if you want to see the most older content in the fastest way possible, you should find a handful of people and blast through it. But, if you're new to this whole "group activity" thing, how do you get yourself ready for it? I'm glad you asked. Here are a few tips. 1) You know, mostly, how to play the toon you're planning to run groups with, right? If you're in a guild, there is a good chance they are more than happy to have you bring that mage you just boosted to 90 so long as you don't pull aggro off the tank. Learn what the buttons mean. You don't have to know exactly when to push them, but if you're not sure of what a button does, don't go. Spend some time at the training dummies in your garrison or in the major cities and just push them, all at once. See what happens. If you're supposed to hold aggro and can't or are supposed to heal and don't or supposed to not pull aggro but do, your group won't be very happy with you. Ask in guild chat for tips, if the class is new to you. Do some solo work so you're familiar with some sort of rotation. The more confident you are, the more confident you'll feel and you'll project that confidence to the group. 2) You know, mostly, where you're going in the game. Do not consistently ask for summons. Summoning stones are outside raids to facilitate formation of groups. If your guild sees that you never show up on your own, well, enjoy your view from wherever you are. Learn where things are and go there. I had a lady in my guild who couldn't find her way out of a paper bag with a flashlight, a seeing eye dog, a map AND a neon arrow pointing to the exit. Her son made a binder for her of all the maps and circled the flight points and the locations for every raid and 5-man in the game at that time. Everything was alphabetized, too. When we ran "Nexus", she just opened her folder to "N" and there was the map of Borean Tundra with Coldarra circled. We couldn't use acronyms when she was coming with us because she just couldn't figure those out, but that was a small price to pay to have to say, "Temple of Ahn Qirag" instead of "AQ40" and know she would start heading that way or, sometimes be there to help summon. It delays the run of the group to have to summon everyone and, frankly, you look like a slacker. Why would a group want to take a slacker? Find where things are and start heading there if it's some place you have to get to. 3) Come with food and flasks. My guild has flasks and food available for all raiders. You take a few and add a few. Don't be dependent upon someone else in the guild to furnish these. You should have healing potions and bandages, too. The strategic application of a bandage or the quick consumption of a health pot can down a boss and avoid a wipe. 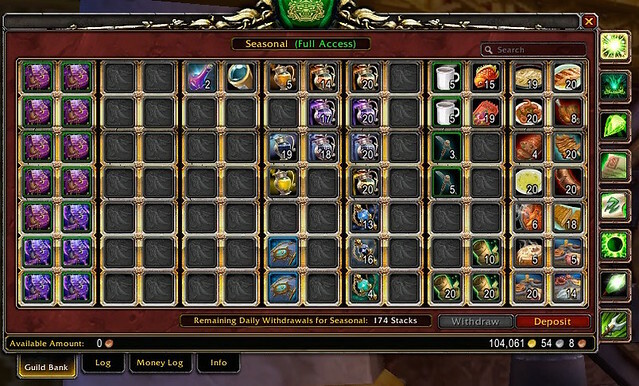 If your guild requires you buy these, do so. Eat and drink before the first pull so you are ready. 4) If your guild has raiding/group policies, know them, by heart. If they require a certain voice server, have it installed and ready to go for your first group experience. Generally, voice is not expected for LFR or Looking for Group runs. The key for those runs is to get done as quickly as possible, so voice is rarely offered. Someone has to maintain it and they run the risk of some troll hijacking their voice server. 5) Speaking of guild policies, if your guild requires you have read a battle strat, be sure you do it. There are any number of great sites out there which have information on battles. (We'll be covering that topic in the future.) It is helpful if you review strats if you are going into groups alone, without someone you know. Early in an expansion, groups are pretty forgiving if someone says, at the start, "This is my first time in here. What should I know?" After an expansion has been out for 6+ months, people forget they were new to this material themselves so are less likely to be helpful. This leads to the last point. 6) Have a very thick hide. This might be the most important thing. The trolls are everywhere. They feed on your "I don't know this fight". If you are taking a toon you boosted to 90 and then leveled to 100 through a raid, your dps/hps may not be very high, yet. You could get kicked from a raid. I never kick anyone for low numbers. We were all newbies once, but other people are not so forgiving. You need to be able to look at the comments, which could be directed at you, with a jaundiced eye. Helpful people don't tell you to "L2P, noob". I have not seen a person kicked because of low numbers. I have seen them kicked for going afk, complaining, mouthing off to the raid, targeting one person and ragging on them and generally jerkish behavior, but never for low healing or dps numbers. I'm sure it happens, but I won't vote someone out of a group for that. Other group compositions aren't as forgiving so learn to ignore the trolls. If someone gives you advice and it seems to be good advice, thank them. But unless you are being a jerk or standing in stuff you shouldn't be or not avoiding the things you should be, the comments of trolls should roll off you. You can always quit a group, if it gets too pointed, and run the content at a later date. These few suggestions should make your group experience much better. If you never go outside your guild, some of this won't apply to you. On the other hand, if you utilize all the suggestions, you'll be the person in your guild people most want to run with. That's a warm feeling.